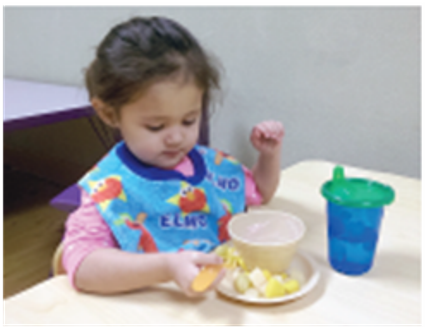 In 2013, the Kalispel Tribe of Indian’s child care center, the Camas Early Learning Center in Washington, enrolled in Start Healthy Start Now (SHSN) to improve children’s health. SHSN, a federally-funded initiative, was launched by Inland Northwest Health Services with 21 regional partners to address obesity challenges in six eastern Washington counties. The goal of SHSN was to increase healthy eating, physical activity and the awareness of adverse childhood experiences by providing training to teachers, cooks and directors of child care centers. The initiative not only provided useful training, but helped fulfill annual professional development hours in the State Training and Registry System (STARS) for the center staff. Cooks were trained on whole foods cooking, including learning knife skills, making homemade soup stock and using whole grains such as quinoa and legumes like lentils. Staff members were engaged in learning creative and brain development physical activities for the children. The training was based on Let’s Move Child Care, a six-step national program that provides obesity prevention resources and trainings for early learning programs. Staff members were also trained on child behavior and development, gaining new knowledge and skills to help children in their care. No one expected the transformation that took place in the lives of the staff and the children at Camas Early Learning Center. “We have changed everything about our cooking… It was a dramatic change for the kids. It’s good for the kids, but it is good for the adults too,” said the cook, Shannon Fitzmorris. With new and more physical activities, the teachers have seen changes in the children too. “The younger ones nap better and wake with more stamina. The older ones are more open to being active and joining games or inventing games during ‘choice’ time,” said Alice Moran, physical education teacher. The center now hosts healthier celebrations and supports changes to improve the health of staff members, such as starting a break time walking club. “We are all in this together. I like being a part of a group that has a goal and a vision, and we put our heads together to make things happen,” said Ms. Moran. In 2014, Washington Governor Jay Inslee launched the Healthiest Next Generation Initiative to help children maintain a healthy weight and enjoy active lives. His 2015-2017 budget makes strategic investments in programs like Start Healthy Start Now to help make sure that the next generation is the healthiest one ever. Indian Health Service’s (IHS) Clinton Service Unit (CSU) in Western Oklahoma has reduced rates of childhood obesity in the local tribal Head Start setting. Through the Healthy Heart Program (HHP), CSU works with three tribal Head Start facilities to focus on healthy eating, physical activity, and instilling the importance of a healthy lifestyle. The Indian Health Service developed a colorful guide called “My Native Plate” to help families eat healthy. It’s colorful and helps make eating in a healthy way easy. The guide shows pictures of 9-inch plates divided into quarters, each with different food groups such as fruit, vegetables, grains and protein. This is a great resource to use in your center or family home, and it can be sent home with children as well.